Welcome to the website for Oklahoma Cleft Lip/Palate-Craniofacial Teams in Oklahoma City and Tulsa. This site was developed by members of the surgical and counseling teams for you as a parent of a child with a cleft lip and/or palate and other craniofacial differences. Whether your son or daughter is a newborn or an older child, dealing with the many issues surrounding their care can be confusing and at times overwhelming. It is natural for you to be anxious and to have many questions about your child's immediate needs and his or her long-term care. Our hope is to relieve some of your anxiety by answering many of the questions you may have. become an active partner with a medical team of specialists whose care and direction will contribute to your child's healthy development. While this information will answer many of your questions, we want you to know that members of the Cleft Lip/Palate-Craniofacial Team are available to answer any further questions you have and to be a resource for you. You don't have to wait for your next appointment to contact us. Please feel free to call or write to any member of our teams at any time. lip/palate-craniofacial team at the john w.
THE UNSPOKEN QUESTION, "WHY DID IT HAPPEN"? 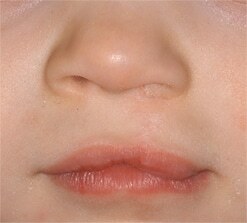 Cleft lip, cleft palate or both is a congenital (birth) defect which is present at birth. It will happen approximately every 700 to 750 births and is probably the most common of congenital birth defects. The defect occurs in males and females and it occurs in all races. No one knows the exact reason that clefts of the oral structures occur and no research has shown any specific cause. The most common theory is that the majority of clefts are due to a genetic predisposition, that when mixed with certain environmental factors, create the malformation. There is some recent evidence that folic acid may reduce the incidence of clefts but this research is still taking place. Clefting occurs at about five to nine weeks into the pregnancy, therefore we know that clefting cannot be caused by events occurring in middle or late pregnancy. 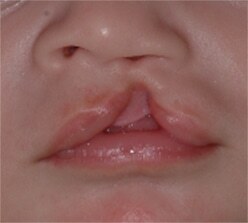 The most common malformation of the face is cleft lip and palate. Clefting can affect about 1 in 660 children born in the United States. The clinic offers INTERDISCIPLINARY CARE for cleft patients through J.W.Keys Cleft and Craniofacial Team, including reconstructive maxillofacial surgery, pediatric dental evaluations, orthodontic and prosthetic care before and after surgery, speech pathology, audiology and pediatrics. There is also referral system in place otorhinolaryngology, genetics and neurosurgery. The goal of the team is to guide and direct parents in a manner that is consistent with the American Cleft Lip and Palate Association team guidelines. The clinic specialists work closely together, taking a flexible approach to the timing of cleft repair, to optimize the child's speech development and facial growth. Cleft lip repair is generally performed at 3-6 months of age, while cleft palate surgery take place at 12 to 15 months of age.